- Area: 109,980 sq km. - Population: 11.5 million inhabitants. - Density: 102 inhabitants / km ². - Capital: Havana (3 million with suburbs). - Major cities: Santiago de Cuba, Camagüey, Cienfuegos, Santa Clara, Holguín. - Currency: there are two outstanding on the island. La Moneda Nacional is the Cuban peso. But many products and services are paid, often by the Cubans and foreigners always, in convertible pesos (CUC), a battered currency in Cuba which has replaced the U.S. dollar and whose unit is worth about € 0.80. - Government: Socialist Republic (united Communist Party). - Head of State: Raúl Castro Ruz who officially replaced his brother Fidel 24 February 2008. - Religions: catholisme, animism and Santeria (Afro-Cuban religion). - Total fertility rate: 1.6. - Average monthly salary: about 13 €. - Average age of population: 35 years. - Life expectancy: about 79 years for women and 75 years for men. - World Heritage Sites by UNESCO: the Old Havana and its Fortifications (1982), Trinidad and the Valley de los Ingenios (1988), the Castle of San Pedro de la Roca in Santiago de Cuba ( 1997); National Park Desembarco del Granma (1999) Viñales Valley (1999), the Archaeological Landscape of the First Coffee Plantations in the Southeast of Cuba (2000), the Alejandro de Humboldt National Park (2001), the historic urban center of Cienfuegos (2005), the Historic Centre of Camagüey (2008). In November 2003, the band and dance Tumba Francesa Santiago was listed by UNESCO as intangible cultural heritage of humanity. The Cuban economy owes much of its difficulties to the embargo, certainly, but also an inefficient economic system. Raúl Castro has also for the effectiveness of a leitmotif of his speeches. After the fall of the Eastern bloc, the island became isolated. For several years, tourism has become a "national priority". The Cuban tourist industry has experienced strong growth, although it has declined by 12% during the international crisis of 2008-2009. One can almost speak of a two-tier society: first, the section of the population in contact with the currencies on the other hand, the majority must be content with a monthly salary in pesos, oscillating between equivalent of € 12 for a sugar cane cutter and 30 € for a policeman. In October 2005, the Ibero-American Summit in Salamanca, Spain, ruled in favor of Cuba by condemning the "blockade" (bloqueo). One year after the severance of diplomatic relations decided by Washington, the White House orders a total embargo on trade with Cuba February 3, 1962, and May 14, 1964, the Food and Drug Administration are on the "blacklist" . Today, not only the blockade is still in force, but was regularly reinforced. The ban extends export in some cases foreign companies with assets in the United States. Although since 2001 the United States is a major supplier of agricultural products in Cuba, the embargo, which is condemned every year at the United Nations almost unanimously by the member countries, has been maintained and even strengthened. 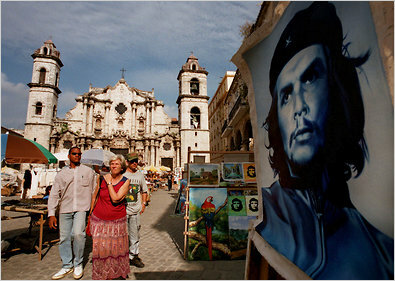 The isolation of Cuba is less obvious today than some years ago. Indeed, the situation is changing in Latin America in the wake left many countries. With 55,000 "public discussion" during which nearly 9 million Cubans had "discussed" the broad economic guidelines coming, the organization of the Sixth Congress of the Cuban Communist Party (CCP) - the first for nearly 13 years - led according to the official propaganda in a demonstration of democratic centralism. The operation culminated on April 19 that the adoption of a series of measures for the least surprising to the Socialist Republic. Mass layoffs of 500,000 civil servants, privatization and land reform, autonomy of state enterprises: more than 300 measures net marking a turning point towards”liberalization" of the Cuban economy and to counter the devastating effects of the embargo maintained by the United States. However, there is little or no evolution. Despite measures to prevent the re-appointments, the Party has narrowed on frames from the revolution ... of 1969. The plan remains highly repressive ("heavy policing" of the population, control the media ...). While many dissidents have been released in 2010 and 2011. However, other dissidents have been arrested again.